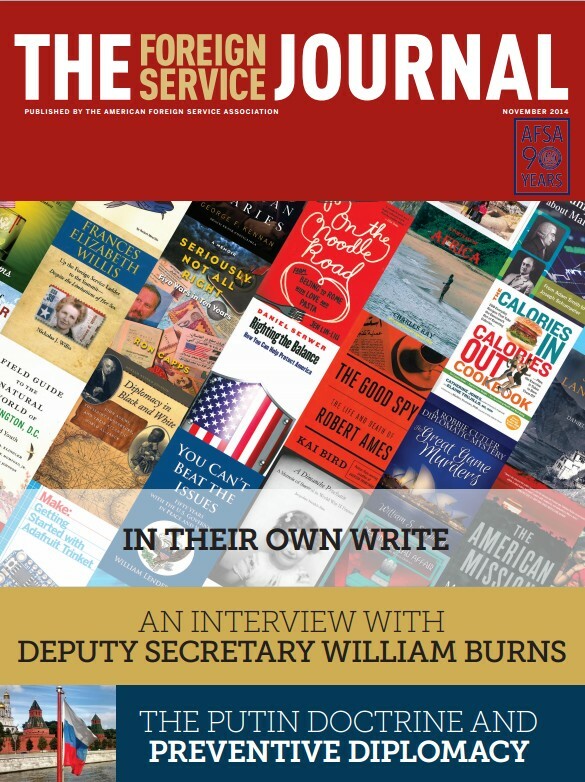 This month’s issue features an interview with outgoing Deputy Secretary of State – and career Foreign Service Officer -- William J. Burns on the eve of his retirement. Burns discusses a number of ongoing foreign policy challenges as well as the future of the Foreign Service. Elsewhere in this issue, retired Ambassador James Goodby takes a close look at Russian President Vladimir Putin and his policies, posing the question of what the appropriate response from the West should be. The issue’s focus is on Foreign Service authors. The annual feature In Their Own Write presents a roundup of more than 60 books written by members of the Foreign Service community, with topics ranging from policy and history to self-help and cooking. We pay our respects to Career Ambassador and civil rights pioneer Terence Todman for his extraordinary career in the Foreign Service. We also we learn about a Civil War-era gadfly, general and stunningly inappropriate politically appointed Ambassador. Retired Ambassador Edward Peck recounts a memorable drive through Algeria as a young diplomat in the 1960s, and AFSA President Bob Silverman reflects on the various personnel systems at the Department of State. On the eve of his retirement, the Deputy Secretary of State reflects on his 33-year career, the challenges for diplomacy today and the future of the Foreign Service. The USSR is not coming back, but the United States must take a realistic approach to Russia, correctly framing the issues and wielding the tools best suited to strategic priorities. When non-career ambassadors are bad, they are sometimes very bad.